Chitturu Nagayya or Chittor V. Nagaiah birth name - Vuppaladadiyam Nagayya (28 March 1904 – 30 December 1973) was an Indian actor, composer, director, producer, writer and playback singer of Telugu film industry, Andhra Pradesh, India. Indian film journalist and the editor of Film India, Baburao Patel, described Nagiah as ‘The Paul Muni of India’. Nagaiah acted in about 200 Telugu films, and 160 films in Tamil, Kannada, Malayalam and Hindi. He was the first South Indian actor to receive Padma Sri award from the Government of India. Nagaiah was born on 28 March 1904 in a pious Telugu Brahmin family in Repalle, Andhra Pradesh. He was taken to Chittoor by his uncle, where he studied and took his B.A. degree. His parents were Ramalinga Sarma and Venkata Lakshmamba. His parents believed that Nagaiah was born to them by the blessings of Snake God, hence named him Nagaiah. The family moved to Kuppam and later to Tirupati, in Chittoor district. He took up studies with the scholarship provided by the Tirupati Devasthanam and took his degree in Chittoor. He worked as a clerk in a government office. Later, he turned into a journalist with "Andhra Patrika". Mahatma Gandhi and Nehru influenced him and he participated in the freedom struggle (Dandi Satyagraha) in 1930. His liking for the fine arts, found himself working with gramophone companies like Hutchins. He found the patronage from the legendary figures in Carnatic music Musiri Subramania Iyer and GN Balasubramanian. MS Subba Lakshmi happens to be his contemporary. He attended the Gowhati Congress conclave with S. Srinivasa Iyyengar. Through his musical renderings, he could impress the young Kamala Nehru at Anand Bhavan in Allahabad. He held strong association with ‘Rama Vilasa Sabha’ a cultural association in Chittoor. He performed several stage plays ‘Sarangadhara’, ‘Viswamithra Chitra Nilayam’, ‘Savitri’, ‘Bruhannala’ and ‘Ramadasu’ and took on the roles of saint poets Pothana, Vemana, Rama Dasu and Thyagiah. He bagged gold medal for his female role as ‘Chitrangi’, in the play ‘Sarangadhara’. During that period he was married to Vijaya Lakshmi, but she demised when she was giving birth to a girl child a year after. He had to marry Girija in order to take care of his daughter. Fate was so cruel to Nagaiah that Girija too died due to miscarriage in the eighth month. The daughter also left the world due to a mysterious disease. All these unfortunate developments had turned Nagaiah into a saint. His long stays at Ramana Maharshi Ashram and several places provided him a deep insight into human nature. He began to love mankind. He joined the Chennapuri Andhra Maha Sabha (CAMS), a popular cultural Association of Andhras in the erstwhile Madras. Nagaiah developed life-time friendship with Bommireddy Narasimha Reddy (BN Reddy- a famed filmmakers of India). H.M.Reddy, a legendary figure in the pre-independence era arrived at Madras from Kolhapur and formed the Rohini Pictures with the association of B.N. Reddy. 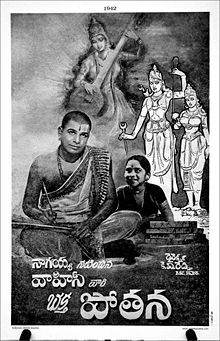 The firm started its first venture in Telugu through the film ‘Gruhalakshmi’ in 1938, in which Nagaiah played a significant role, as the brother of the then popular heroine Kannambha. Later, the association worked through several hits with Vahini Studios. ‘Vande Matharam’ (1939), ‘Sumangali’ (1940), ‘Devata’ (1941), ‘Bhakta Potana’ (1942), ‘Swarga Seema’ (1945), ‘Thygayya’ (1946), ‘Yogi Vemana’ (1947) were huge hits. He started getting offers from the Telugu and Tamil film industries equally. Nagiah became the highest paid actor by the time he was doing the film ‘Beedalapatlu’. His performance in the film ‘Bhakta Potana’ influenced a boy who later turned into a saint and became popular as ‘Balayogi’. The film ‘Thyagayya’ was released in the year 1946 was a fabulous classic film of the South Indian film history. Nagaiah was the producer, director, music director and actor for the film ‘Thyagiah’. a reverberant hit. After that he made films ‘Naa Illu’ in 1953 and ‘Bhakta Ramadas’ in 1964 which turned out to be failures and Nagaiah lost his wealth. Another musical hit of Nagaiah was ‘Chakradhari’, in 1948 based on the story of the Maharashtrian potter-saint Gora Kumbhar. Nagiah was distinctive in his approach towards mankind. He always used to salute every traffic constable while traveling in car and he felt it as an accolade he is offering to them who stands under the sun only to help and guide the people. His unselfishness surpassed the limits and was root cause for his fiscal devastation. He treated everybody as true friend and admitted everyone to take total advantage of his benevolence. Most of the times he went out of the way to expend money only to give pleasures and happiness to people irrespective of their little acquaintance. He had no children of his own yet he was called as ‘Naannagaaru’ (dear father) by most of the people in film industry as he treated everybody as his own children. 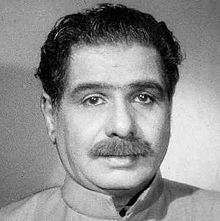 * Nagayya was the first south Indian actor along with Bhanumathi Ramakrishna to be awarded the Padmashri award by the Government of India in 1965. * Abinava Thyagaraju by Thiruvankur Maharaja.